On Feb. 18, President Obama named 105 researchers as recipients of the Presidential Early Career Awards for Scientists and Engineers, the highest honor bestowed by the U.S. government on science and engineering professionals in the early stages of their independent research careers. 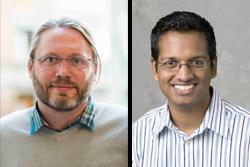 Among these ranks are two Park alumni: Dr. Luke Zettlemoyer ’00, an associate professor in the Department of Computer Science & Engineering at the University of Washington, and Dr. Milind Kulkarni ’02, an associate professor with the School of Electrical and Computer Engineering at Purdue University. The winners will receive their awards at a ceremony in Washington, D.C. this spring. Ziad Ali ’19, an electrical engineering major from Greensboro, N.C., represented NC State in the Jeopardy! College Championship, competing in the Quarterfinals on Feb. 5 and the Semifinals on Feb. 10. He came away with a $10,000 Semifinalist prize. Check out the Jeopardy! website for a complete list of participants and great video highlights of the competition. Matt King ’01 – Photo © FanDuel, Inc.
Matthew King ’01, chief financial officer at FanDuel, Inc., sat for an interview with FRONTLINE, the PBS documentary series, about the past, present, and future of the fantasy sports industry. King holds undergraduate degrees in economics and mechanical engineering from NC State. 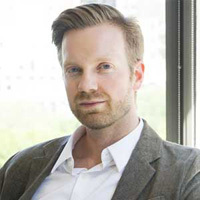 Prior to his role with FanDuel, he worked in the financial sector with Kohlberg Kravis Roberts & Co. L.P. (KKR) and, previously, McKinsey & Company. 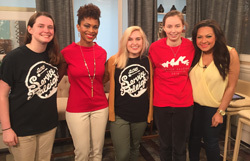 Service Raleigh 2016 co-chairs Ashlyn Johnson ’17, Sarah Bristol (Goodnight Scholar and Caldwell Fellow ‘17), and Ashle Page (Goodnight and Centennial Scholar ‘17) promoted the event on My Carolina Today, a local television program. The 19th annual Service Raleigh, an event connecting about 2,000 volunteers with local organizations in need of helping hands, will be held on Saturday, Apr. 9. Register today to participate!